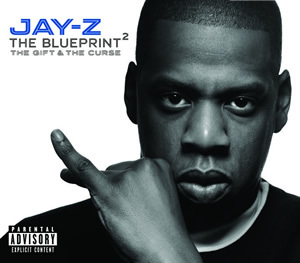 Jay-Z releases seventh studio album "The Blueprint²: The Gift & The Curse"
The Blueprint²: The Gift & The Curse is rapper Jay-Z's seventh studio album released in 2002. Parts of the album were later reissued as The Blueprint 2.1 in 2003. This album, like Jay-Z's previous four, debuted at #1 with over 545,000 units shipped in its first week of sales. The album was criticized for its more pop-oriented sound as well as its plethora of guests, while The Blueprint had been almost devoid of guest appearances. Though the album has no strict concept in view, the first disc The Gift generally has more upbeat, party tracks, including the hit singles "'03 Bonnie & Clyde" and "Excuse Me Miss." The Curse has a somewhat darker tone, including fewer guest appearances, disses to Nas, and Jay-Z's former mentor Jaz-O on "Blueprint 2" and a dramatic street tale on "Meet the Parents." Signed Roc-A-Fella Records producers Kanye West and Just Blaze, as well as longtime collaborators The Neptunes and Timbaland contributed heavily to the album's production. Other producers are Dr. Dre, Heavy D, and No I.D.. At this time, it is assumed that Jay-Z had just started a relationship with singer Beyonce Knowles. On August 8th, 2002 rapper Kanye West was signed to record label Roc-A-Fella. On October 13th, 2002 Kanye West had a track that was susposed to be on The Blueprint & The Blueprint²: The Gift & The Curse called "Never Let Me Down". That never made the listing on 2001's album Blueprint. So Kanye West tried to put on Blueprint 2 but it didn't make the cut that time either. "The Bounce" ended up featuring Kanye, and "Never Let Me Down" was on Kanye's debut, The College Dropout.